Hanoi (VNA) – Prime Minister Nguyen Xuan Phuc’s visit to Thailand was fruitful, with the two PMs discussing frankly cooperation in both bilateral and multilateral frameworks, stated Deputy Foreign Minister Dang Dinh Quy. During the visit from August 17-19, PM Phuc and his Thai counterpart Prayuth Chan-o-cha sought collaboration measures to build the ASEAN Community and maintain the association’s central role on the occasion of ASEAN’s 50th founding anniversary, as well as ways to strengthen bilateral cooperation within sub-regional programmes and projects. The two sides discussed long-lasting issues such as how to minimise conflicts at sea, illegal fishing and smuggling on each other’s waters, and illegal Vietnamese workers in Thailand. They agreed to accelerate negotiations on an agreement on criminal extradition and a treaty on mutual legal assistance, as well as the expansion of the treaty on labour as Thailand has high demand for labourers while Vietnam has a large supply. At the same time, the two PMs decided to set up mechanisms to settle existing problems with these incomplete agreements, thus avoiding further issues, said Deputy FM Quy. PM Phuc was also keen to boost economic partnerships with Thailand to balance trade and increase investment, especially in tourism, as the number of Thai tourists to Vietnam is one fourth of Vietnamese visitors to Thailand. The Government leader also met with businesses of both countries. During the visit, he attended the signing of dozens of agreements and memoranda of understanding between ministries, sectors, localities and businesses of both sides, noted Quy. The Deputy FM stressed that a highlight of the PM’s visit was his meetings with the Vietnamese community in Thailand. 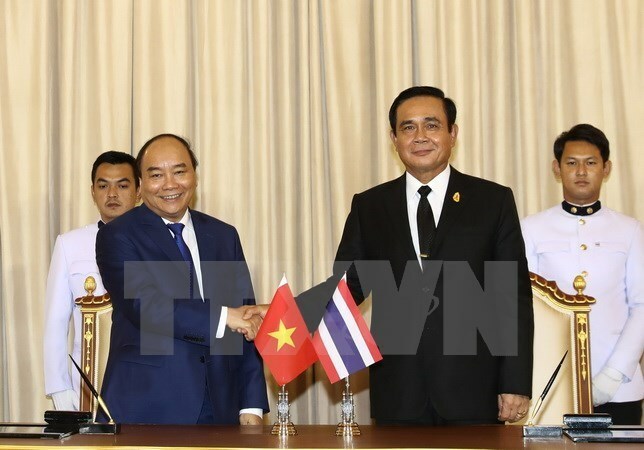 The PM pledged to create favourable conditions for them to contribute to the homeland by promoting economic connectivity between Thailand’s northeastern region with central regions of Laos and Vietnam. Quy said that in all of his meetings with Thai officials and local community, PM Phuc thanked the King, Government and people of Thailand for supporting the Vietnamese community, while expressing hope that the Thai side continue creating favourable conditions for the community. Notably, in a retreat meeting with the Thai PM, PM Phuc proposed issuing legal documents to old Vietnamese people in Thailand, enabling them to travel to their homeland. He also gave a list of 59 old people in need of the documents. The Thai PM assigned the Minister of Foreign Affairs to tackle the issue. “Vietnam and Thailand compete in football, but should cooperate in all other fields,” stated PM Phuc, a statement his Thai counterpart agreed with. Deputy FM Quy expressed belief that the visit will result in new development in bilateral ties, as it helped foster mutual political trust and determination to create favourable legal conditions for existing problems, while changing mindsets from competition to cooperation.